As a nation of immigrants, do we really know what assimilating means for so many? The Flomenhaft Gallery is proud to combine the works and stories of a Native American, a Japanese American, a Chinese American, three African Americans, an Indian American from Mumbai, and Russian Émigré photographers. Each of their trials and triumphs are reflected in their art, sometimes explicitly, sometimes just laid out for viewers to experience. Born in 1940 on the Confederated Salish and Kootenai Indian Reservation, Montana, Jaune Quick–to–See Smith is an internationally renowned artist. Since the 1970s she has created abstract works that include socio-political commentary on her people’s painful story, past and present. Her art blends collage elements of commercial slogans, layered text, and symbolism. Asked about spots on Mischief War Shirt, she said, “It relates to the small pox we received with blankets sent to keep us warm on reservations.” Smith was awarded four Honorary Doctorates, the Joan Mitchell Foundation Painters Grant, a Lifetime Achievement Award from the Women's Caucus for the Arts, the College Art Association’s Committee on Women in the Arts Award, and has been admitted to the New Mexico Women’s Hall of Fame. Roger Shimomura’s paintings and prints, also address socio-political issues. Born in Seattle, Washington, he spent two years of his childhood in Minidoka (Idaho), one of 10 internment camps for Japanese Americans during WWII. Shimomura is third generation Japanese American but all Japanese had to leave homes, businesses and give up their finances. He received a BA from the University of Washington, Seattle, and an MFA from Syracuse University, New York. He has had over 130 solo exhibitions of paintings and prints, presented experimental theater pieces at the Walker Art Center, Minneapolis and The Smithsonian Institution, Washington, DC. He is the recipient of over 30 grants, 4 are National Endowment for the Arts Fellowships in Painting and Performance Art. He was a visiting artist at more than 200 universities, art schools, and museums. Born and raised in Oakland California’s Chinatown, Flo Oy Wong is a Sunnyvale, California-based mixed media installation artist and a visual storyteller. She is a “paper person” and like other Chinese immigrants her family is known as a “paper family.” Her father was born in China and came to America in 1912. Wong’s mother, who was also born in China, married Wong’s father in 1926, but was not legally allowed to come to the United States. The 1882 Chinese Exclusion Act did not allow Chinese workers to bring in wives. Many families purchased false papers that stated that the wives were teachers or sisters, but not wives. With documents like these, Wong’s mother came here as Wong’s father’s “sister.” Legally Wong’s father was her uncle. Flo Oy Wong’s art is about the lives of “paper people.’ This false identity shaped her development and her creativity. 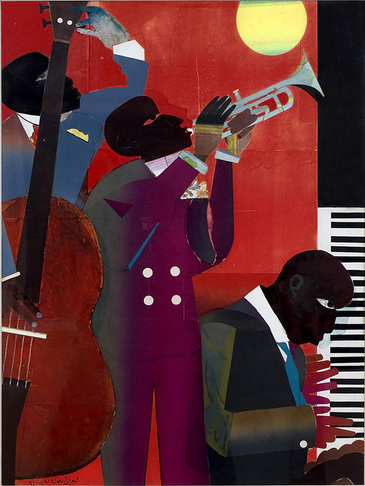 Romare Bearden was born September 2, 1911, in North Carolina and grew up in Harlem. He had a degree in education, but his first love was art. He is considered one of the most important American artists of the 20th century, one of the great masters of collage. He was renowned for depicting aspects of African-American culture in the Cubist style. A primary theme was jazz. Up at Minton’s has painted collage elements for which Bearden is renowned. This work offers a microcosmic view of the jazz musicians’ life during the Harlem Renaissance when they went to Minton’s after their gigs and played by the light of the moon. Beverly Buchanan, born in 1940 in Fuquay, North Carolina, was raised in Orangeburg, South Carolina, on the campus of South Carolina State College, where her father was Dean of the School of Agriculture. Her paintings, primarily pastels, and her sculptures are poetic works as rich in dignity as they are in complexity. Her major body of work is based, in part, on the sharecropper shacks that she saw along the back roads of the rural South. In 1980, Buchanan was awarded fellowships from the John Simon Guggenheim Memorial Foundation and the National Endowment for the Arts. Her work is in the collections of the Metropolitan Museum of Art, New York; the Carnegie Museum of Art, Pennsylvania; and the Columbia Museum of Art, Columbia, South Carolina; and many others. Emma Amos, painter, printmaker, and weaver was born in 1938 and grew up in Atlanta, Georgia. She received a BA from Antioch University in Ohio, and went to the Central School of Art in London to earn a diploma in etching in 1960. In 1965 she earned her MA from New York University. Hale Woodruff invited her to become a member of Spiral, a group of African-American artists that included Romare Bearden, Norman Lewis, and Charles Alston. She was the group’s youngest and only female member. Amos ably uses her paintings as a means to analyze and question the validity of canonical traditions and institutions that for so long have been biased against the inclusion of women and artists of color. Siona Benjamin, a painter originally from Mumbai, India, combines her Jewish heritage with experiences growing up in a predominantly Hindu and Muslim country. In her paintings, she brings together the imagery of her past with the role she plays in America today, resulting in a mosaic inspired by Indian miniature paintings, ancient myths, Sephardic icons, pop imagery, and personal experiences. In the mid-1990s Benjamin addressed the topic of “Finding Home.” It became an ongoing series connecting her personal exploration of home as a physical and psychological space. Her art inspires viewers to re-evaluate notions about place, race, and war. She seeks to raise social consciousness about values in our world. Her art has been shown in many museums, featured on TV, The New York Times, Art and Antiques, Art in America, ArtNews and others. She is a 2011 Fulbright Fellow. Rimma Gerlovina and Valeriy Gerlovin are Russian émigré collaborative photographers. Rimma’s face is central to the photographs, but they are not portraits. They are used for personifications of different stages of psychological and visionary experience. Their roles as observers and the observed are extended into the unifying state of being the observatory itself. The artists play with paradoxes that go beyond the limit of reasonable logic. Rimma and Valeriy were founding members of the underground conceptual movement in Soviet Russia. Since coming to the United States in 1980, they have had many exhibitions in galleries and museums worldwide, including the Venice Biennale; the Guggenheim Museum; and the Smithsonian American Art Museum, Washington, DC.